Andrew Ettingshausen is as tough as they come. 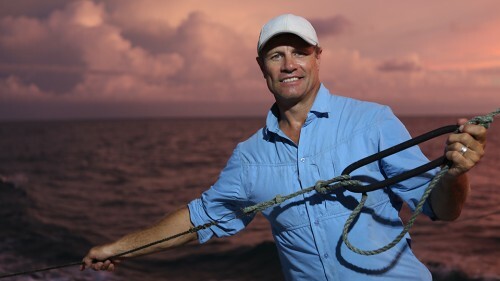 The rugby league legend has an affinity with the sea and has made it his mission to catch every big fish on the planet. Now he's going to discover what it takes to make it as a commercial fisherman in a country known for its tough land, rough sea and rugged people. He’ll discover the history of Australia's maritime industry whilst experiencing first-hand why people are willing to risk their lives on a daily basis. Plus he’ll reveal some of Australian-first, high-tech aquaculture solutions that are poised to not only solve some of our oceans’ biggest problems, but save declining fish stocks around the world. The Northern Territory’s full of saltwater crocodiles, fish with teeth and sweltering heat. In this episode Andrew Ettingshausen faces them all. First stop - a saltwater Barramundi farm. With only a cricket helmet for protection, Andrew catches 500 Kg of thrashing, fighting fish by hand. Next, he ups the danger level and helicopters into saltwater crocodile country. His mission… harvest croc eggs from a very protective mum. Then it’s onto a 2-day fishing trip deep into the Arafura Sea. Here Andrew takes on a fish with teeth, the Spanish mackerel. Finally pushing his stamina to the limit, Andrew ends his Northern Territory adventure trawling for Banana Prawns. This is a million dollar industry where rest is not an option and the competition is always after your catch. Deep down south, at the end of the world, we join Andrew Ettingshausen off the wild coast of Tasmania. First it’s a gut churning adventure on the high seas in search of Blue Eye Trevalla. Cold, wet and sick, Andrew learns that demersal long-line fishing is a tough gig for tough blokes. 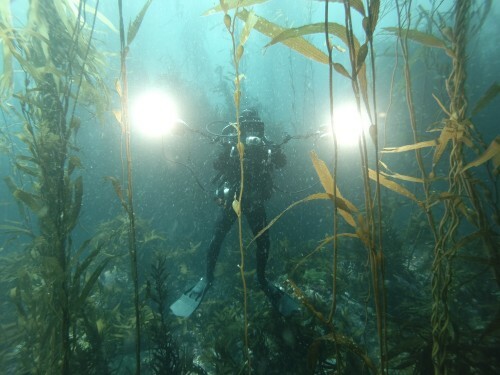 Next Andrew scores one for the environment by turning pest into culinary profit when he harvests Long-spined Sea Urchins from the Tasmanian kelp forest. Then in the cold dark waters of the Tasman Sea, Andrew lights up the night squid fishing. And finally, Andrew joins the hunt for a delicacy worth more than any other seafood: the southern rock lobster. The trick is you’ve got to catch them first. Off the Queensland coast Andrew Ettingshausen visits the Great Barrier Reef. It’s a trip of a lifetime that almost costs him his life, when a sea slug diving operation goes wrong. Next Andrew takes on the famous Queensland Mud Crab. Known for its strong flavour and fearsome claws, Andrew is challenged to keep his fingers and toes in intact, when he gets the crabs ready for market. His next adventure takes him to the wild waters of the coastal flats. Here he meets an old-school net fisher as wild as the water he works in. And finally Andrew heads back out on the Great Barrier Reef. 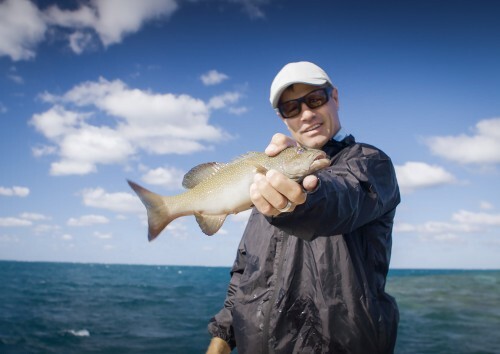 This time he’s with a bunch of highly skilled fisherman who catch coral trout by hand in a highly unique way. South Australian is known as the Seafood capital of Australia. Off the coast Andrew Ettingshausen is being initiated into the high stakes world of commercial fishing. First he’s taken out of his comfort zone and onto the decks of the fast paced Blue Swimmer Crab Fishery. Here he learns dodging pincers is the easy part; not falling off the back of the boat while keeping up with five experienced fisho’s, takes guts and determination. 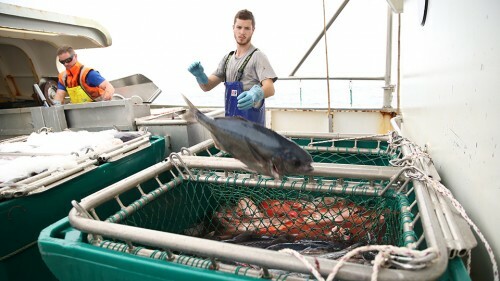 Next Andrew is put to work on an open ocean tuna farm. Here, feeding thousands of hungry tuna their tucker is hard yakka, but battling mobs of peckish birds makes this an air/sea feeding frenzy. And did someone mention the circling sharks? Then closer to land Andrew goes oyster farming. This is hard labour in chest deep water, and that’s before he gets to the factory floor. And finally Andrew goes garfish net fishing on the shallow waters of the Spencer Gulf.